"Gambling house" redirects here. It is not to be confused with Gambling House (film). This article is about establishments for gambling. For other uses, see Casino (disambiguation). Casino is of Italian origin; the root casa means a house. The term casino may mean a small country villa, summerhouse, or social club. During the 19th century, the term casino came to include other public buildings where pleasurable activities took place; such edifices were usually built on the grounds of a larger Italian villa or palazzo, and were used to host civic town functions, including dancing, gambling, music listening, and sports; examples in Italy include Villa Farnese and Villa Giulia, and in the US the Newport Casino in Newport, Rhode Island. In modern-day Italian a casino is either a brothel (also called casa chiusa, literally "closed house"), a mess, or a noisy environment, while a gaming house is spelt casinò, with an accent. In military and non-military usage in German and Spanish, a casino or kasino is an officers' mess. Gambling at the Orient Saloon in Bisbee, Arizona, c.1900. Photograph by C.S. Fly. In American history, early gambling establishments were known as saloons. The creation and importance of saloons was greatly influenced by four major cities: New Orleans, St. Louis, Chicago and San Francisco. It was in the saloons that travelers could find people to talk to, drink with, and often gamble with. During the early 20th century in America, gambling became outlawed and banned by state legislation and social reformers of the time. However, in 1931, gambling was legalized throughout the state of Nevada. America's first legalized casinos were set up in those places. In 1976 New Jersey allowed gambling in Atlantic City, now America's second largest gambling city. Video Lottery Machines (slot machines) have become one of the most popular forms of gambling in casinos. As of 2011[update] investigative reports have started calling into question whether the modern-day slot-machine is addictive. Casino design—regarded as a psychological exercise—is an intricate process that involves optimising floor plan, décor and atmospherics to encourage gambling. Factors influencing gambling tendencies include sound, odour and lighting. Natasha Dow Schüll, an anthropologist at the Massachusetts Institute of Technology, highlights the decision of the audio directors at Silicon Gaming to make its slot machines resonate in "the universally pleasant tone of C, sampling existing casino soundscapes to create a sound that would please but not clash". Dr Alan Hirsch, founder of the Smell & Taste Treatment and Research Foundation in Chicago, studied the impact of certain scents on gamblers, discerning that a pleasant albeit unidentifiable odour released by Las Vegas slot machines generated about 50% more in daily revenue. He suggested that the scent acted as an aphrodisiac, causing a more aggressive form of gambling. Casino designer Roger Thomas is credited with implementing a successful, disruptive design for the Las Vegas Wynn Resorts casinos in 2008. He broke casino design convention by introducing natural sunlight and flora to appeal to women. Thomas put in skylights and antique clocks, defying the commonplace notion that a casino should be a timeless space. According to Bloomberg, accumulated revenue of the biggest casino operator companies worldwide amounted almost US$55 billion in 2011. SJM Holdings Ltd. was the leading company in this field, and earned $9.7 billion in 2011, followed by Las Vegas Sands Corp. ($7.4 bn). The third-biggest casino operator company (based on revenue) was Caesars Entertainment, with revenue of US$6.2 bn. Monte Carlo Casino, located in Monte Carlo city, in Monaco, is a famous casino and a tourist attraction popular with well-off visitors. The casino is mentioned in the song The Man Who Broke the Bank at Monte Carlo as well as the film of the same name. Monte Carlo Casino has been depicted in many books, including Ben Mezrich's Busting Vegas, where a group of Massachusetts Institute of Technology students beat the casino out of nearly $1 million. This book is based on real people and events; however, many of those events are contested by main character Semyon Dukach. 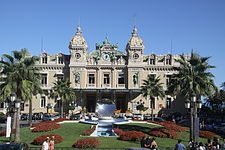 Monte Carlo Casino has also been featured in multiple James Bond novels and films. Casinò di Campione is located in the tiny Italian enclave of Campione d'Italia, within Ticino, Switzerland. The casino was founded in 1917 as a site to gather information from foreign diplomats during the First World War. Today it is owned by the Italian government, and operated by the municipality. With gambling laws being less strict than in Italy and Switzerland, it is among most popular gambling destination besides Monte Carlo. The income from the casino is sufficient for the operation of Campione without the imposition of taxes, or obtaining of other revenue. In 2007, the casino moved into new premises of more than 55,000 square metres (590,000 sq ft), making it the largest casino in Europe. The new casino was built alongside the old one, which dated from 1933 and has since been demolished. 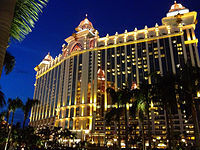 The former Portuguese colony of Macau, a special administrative region of China since 1999, is a popular destination for visitors who wish to gamble. This started in Portuguese times, when Macau was popular with visitors from nearby British Hong Kong, where gambling was more closely regulated. 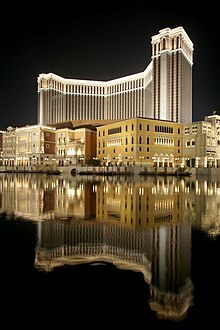 The Venetian Macao is currently the largest casino in the world. Macau also surpassed Las Vegas as the largest gambling market in the world. 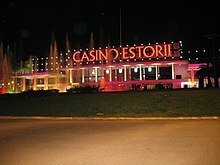 The Casino Estoril, located in the municipality of Cascais, on the Portuguese Riviera, near Lisbon, is the largest casino in Europe by capacity. During the Second World War, it was reputed to be a gathering point for spies, dispossessed royals, and wartime adventurers; it became an inspiration for Ian Fleming's James Bond 007 novel Casino Royale. 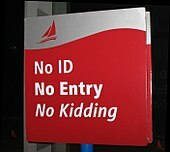 Singapore is an up-and-coming destination for visitors wanting to gamble, although there are currently only two casinos (both foreign owned), in Singapore. 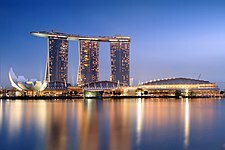 The Marina Bay Sands is the most expensive standalone casino in the world, at a price of US$8 billion, and is among the world's ten most expensive buildings. The Resorts World Sentosa has the world's largest oceanarium. With currently over 1,000 casinos, the United States has the largest number of casinos in the world. The number continues to grow steadily as more states seek to legalize casinos. 40 states now[when?] have some form of casino gambling. 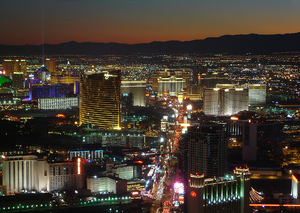 Relatively small places such as Las Vegas are best known for gambling; larger cities such as Chicago are not defined by their casinos in spite of the large turnover. The Nevada Gaming Control Board divides Clark County, which is coextensive with the Las Vegas metropolitan area, into seven market regions for reporting purposes. 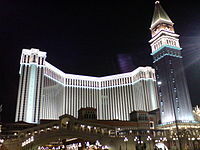 Casinos have been linked to organised crime, with early casinos in Las Vegas originally dominated by the American Mafia and in Macau by Triad syndicates. According to some police reports, incidences of reported crime often double and triple in communities within three years of a casino opening. In a 2004 report by the US Department of Justice, researchers interviewed people who had been arrested in Las Vegas and Des Moines and found that the percentage of problem or pathological gamblers among the arrestees was three to five times higher than in the general population. It has been said that economic studies that show a positive relationship between casinos and crime usually fail to consider the visiting population at risk when they calculate the crime rate in casino areas. Such studies thus count the crimes committed by visitors, but do not count visitors in the population measure, and this overstates the crime rates in casino areas. Part of the reason this methodology is used, despite it leading to an overstatement of crime rates, is that reliable data on tourist count are often not available. There are unique occupational health issues in the casino industry. The most common are from cancers resulting from exposure to second-hand tobacco smoke and musculoskeletal injury (MSI) from repetitive motion injuries while running table games over many hours. . The Venetian in Paradise is also the headquarters of casino giant Las Vegas Sands. ^ "Should Internet Gambling Be Legalized?" (July 29, 2010). [New York Times], Retrieved 7/20/2011. ^ a b Thompson, William N. (2015). Gambling in America: An Encyclopedia of History, Issues, and Society. p. 43. Retrieved August 17, 2015. ^ Preble, Rossi, Keith, Francesco (2014). Il vero italiano: Your Guide To Speaking "Real" Italian. p. 66. Retrieved August 17, 2015. ^ "Avalon Casino Ballroom". Avalonball.com. Archived from the original on 2009-07-01. Retrieved 2009-06-21. ^ "Special catalogues in the Drama Collection". The Royal Library. Retrieved 2007-07-09. ^ "Itinerary Details". sailingshipadventures.com. Archived from the original on November 23, 2015. Retrieved August 17, 2015. ^ Thomassen, Bjørn (2014). Liminality and the Modern: Living Through the In-Between. Ashgate Publishing, Ltd. p. 160. Retrieved August 17, 2015. ^ "How Old Do You Have To Be To Go To A Casino?". Retrieved 2018-04-07. ^ "Slot Machines: The Big Gamble" Archived July 13, 2011, at the Wayback Machine, (Jan. 10, 2011). CBS 60 Minutes, Retrieved 7/20/2011. ^ Creating Compulsion: An Investigation Into Casino Design, Architecture and Ambience Archived November 4, 2013, at the Wayback Machine, LiveCasino.co.uk, Retrieved 2/9/2013. ^ S l ot machines: a lose lose situation (June 8, 2013). The Guardian, Retrieved 2/9/2013. 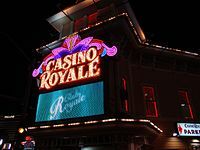 ^ "The psychology behind casino design Archived 2013-08-01 at the Wayback Machine", (August 24, 2011). Time Out Chicago Archived 2013-09-12 at the Wayback Machine, Retrieved February 9, 2013. ^ "How disruptive design made Wynn Resorts' casinos highly profitable", (March 26, 2012). Smart Planet, Retrieved 2/9/2013. ^ "Casinos". ngb.org.za. Retrieved 22 May 2017. ^ "Poland Gambling Casinos A-K". ildado.com. Retrieved 22 May 2017. 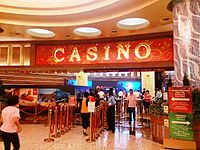 ^ "Las Vegas and Macau Casinos Revenue - Travel and Gamble - Online Magazine about Gambling and Travelling". 22 October 2012. Archived from the original on 24 June 2017. Retrieved 22 May 2017. ^ "ThePOGG Interviews - Semyon Dukach - MIT Card Counting Team Captain". Retrieved 2012-10-11. .
^ a b Frank Jacobs (May 15, 2012). "Enclave-Hunting in Switzerland". The New York Times. ^ a b "Gambling: Losing streak". The Economist. 21 September 2013. 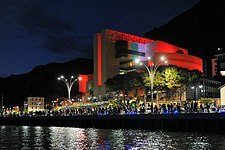 ^ "Casinó Campione d'Italia". Arounder. VRWAY Communication. Retrieved 2012-10-16. 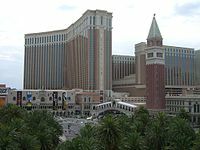 ^ "10 Of The World's Largest Casinos: The Biggest Casinos Ever!". 25 February 2016. Retrieved 22 May 2017. ^ "Casino Management and Operations". Gambling Info. Retrieved 23 June 2011. ^ Knightly, Arnold M. (February 2007). "Blink and you'll miss him". Casino City Times: 1. Retrieved 2011-01-30. ^ "Tribes to pay Conn. $25m in slot accord" Archived 2012-05-12 at the Wayback Machine, (August 27, 2009). The Boston Globe, Retrieved July 20, 2011. ^ Doug McKinlay (2010-12-07). "When the mob ruled Vegas". Financial Times. ^ Jeff German (2014-03-09). "From Siegel to Spilotro, Mafia influenced gambling, regulation in Las Vegas". Las Vegas Review-Journal. ^ Katie Hunt (2013-06-18). "The dark side of Asia's gambling Mecca". CNN. ^ Emma Reynolds (2016-10-19). "Murky world of Chinese high-rollers and organised crime". New Zealand Herald. ^ "Gambling addiction leads many down criminal road" Archived 2011-06-25 at the Wayback Machine, Jeremy Boren, (June 19, 2011). The Pittsburgh Tribune-Review, Retrieved 7/20/2011. ^ "CDC - NIOSH Health Hazard Evaluations (HHEs)". www.cdc.gov. 2018-11-30. Retrieved 2018-12-10. ^ Health, CDC's Office on Smoking and (2018-05-09). "Smoking and Tobacco Use; Fact Sheet; Ventilation Does not Protect From Secondhand Smoke". Smoking and Tobacco Use. Retrieved 2018-12-10. ^ "WorkSafeBC". www.worksafebc.com. Retrieved 2018-12-10.